This website was started in 2012 as a resource for homeowners that find or suspect mold in their homes, and are not sure what to do. Our goal is to provide education and guidance, so that you will know how to safely find, remove, and prevent a mold problem from returning. This website is updated on a weekly basis. Scott started this website in 2012, after finding mold in his attic. After realizing there was not enough reliable information written for homeowners on the web, he thought it was important to set up an independent resource that was not funded by the mold remediation industry. His goal for the website is to ensure that it has all the necessary information and resources available to help homeowners and renters navigate through a mold problem. He oversees all areas including website design and updating of content. Scott can be reached through our contact us page. Since 1992 Joe has been in the residential and commercial building services industry. Joe founded Cleantec in 1995, which grew to a staff of 30 employees. In 2016, after selling Cleantec, Joe founded Haven Environmental, a consulting firm that draws on his 25+ years of experience and training to provide inspection and training for industry professionals throughout the Northeast US. Joe has completed his New York State licensing requirements to perform and oversee residential property inspections, mold assessment, and microbial remediation. He is certified by the IIRC in emergency water restoration, applied structural drying, and applied microbial remediation. He is certified by NACHI in mold assessment and remediation. He is also certified by OSHA in safety training. He is a member of IICRC (Institute of Inspection, Cleaning, and Restoration Certification), NORMI (National organization of Remediation and Mold Inspection), GSAR (Greater Syracuse Association of Realtors), and NACHI (National Association of Certified Home Inspectors). Stephanie Boland is a professional writer, with experience writing on topics related to mold and water damage as well as construction, finance, healthcare and more. With a focus on making complex information become simple and compelling, she handles our content development, feature writing and social media. 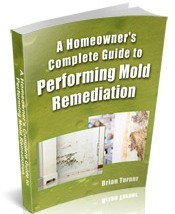 Our step-by-step guide is written for the homeowner that knows nothing about mold removal. The most important thing you can do is educate yourself. Mold removal can be incredibly complex, and different remediation companies may tell you different things. You need to be sure all of the mold is being properly and safely removed, and the cause of your mold issue is resolved. If you are thinking of trying to remove the mold yourself, our guide will help you decide if it is too big of a job. It carefully explains the mold removal process, so that you are properly educated and ready to tackle your mold problem. You are not alone. We are there to help you every step of the way. If you are not able to find all of the information you need, please contact us. If you would like to share your story with others, visit our Stories About Mold In The Home page.